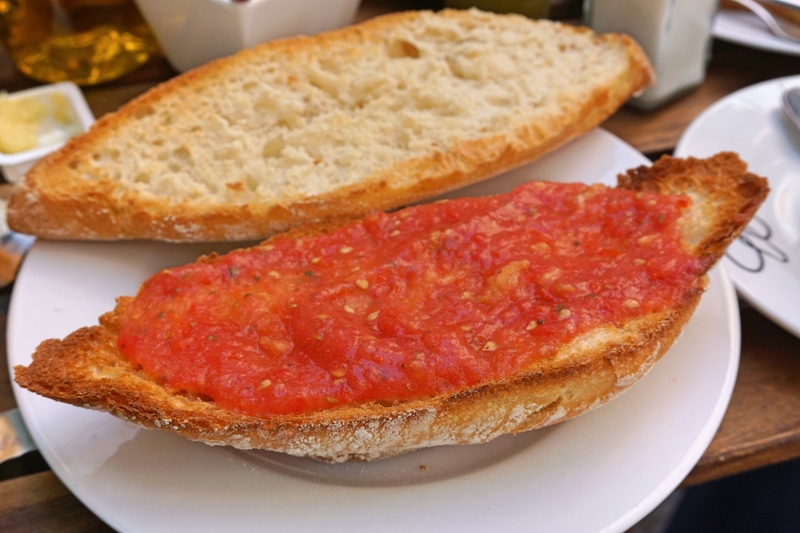 Pa amb tomàquet (tomato bread) is one of those foods that you can’t believe you didn’t know about sooner. Incredibly simple to make, yet infinitely delicious, surely this is a food that somebody will make trendy over in the UK at some point. Maybe you’re even reading this now and thinking, that could be me. I say, go for it! I would totally stop by regularly for an affordable pan con tomate, as it is also called. Because affordable is definitely what it is in Spain, and in my opinion what it should be, given the relatively low cost to make (which also means you can try it at home – yay!). Essentially, this popular breakfast dish consists of bread, usually toasted, with tomato pulp brushed on (sometimes garlic rubbed over first) and seasoned with salt and olive oil. Pa amb tomàquet is also eaten as a tapa, for merienda (an afternoon snack between lunch and dinner), or basically whenever you feel like it. Because the dish consists of very few ingredients, their freshness and quality is of utmost importance for a tasty bread and tomato feast. The best bread for pan con tomate is rustic and crusty, but a good baguette or ciabatta will often do as well. Tomatoes* should be vine-ripened and juicy, the garlic fresh, and the salt flaky, from the sea. 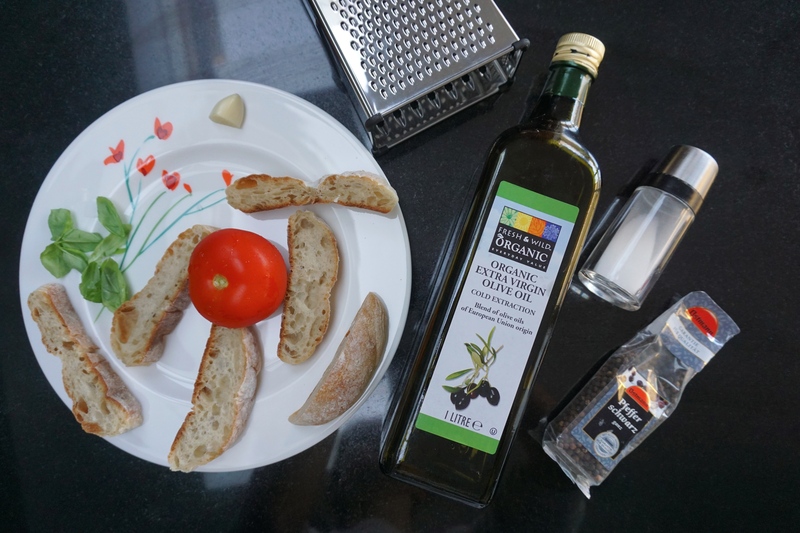 A good-quality virgin extra olive oil is also essential. Catalan gastronomy in Catalonia (the northeastern part of the Iberian peninsula) has a long culinary tradition, with culinary processes described in documents since the 15th century. It is one of the cuisines of the Mediterranean, and thus makes abundant use of ingredients of the region: olive oil, bread, seafood, vegetables, and more. It’s not surprising then, that something like pa amb tomàquet (in Catalan), or pan con tomate (in Castilian/castellano – i.e. standard Spanish), would have developed. Before the tomato was introduced to Europe from the Americas in the 16th century, toasted bread rubbed with garlic and seasoned with oil was already a Mediterranean custom. According to Catalan cooking historian Nèstor Luján, the first written reference of pa amb tomàquet is from 1884, when the recipe was created in the countryside due to an abundant tomato harvest. Bread seemed like a good match, because the tomatoes on a slice of hard and dry bread had the effect of softening it, thereby making it more palatable. Who would have thought at the time, that the fruit of the Americas, tomato, paired with the bread and olive oil of the Mediterranean, would make for such a simple yet delicious snack or meal? Yet the development seems natural, given that pa amb tomàquet was created at a time when throwing away left-overs, such as bread gone stale, was not an option. Because that’s what people could afford, bread was made usually once every week or so. The hard bread soaked up with juicy tomato pulp became not just an edible snack between meals, but a deliciously succulent one as well. 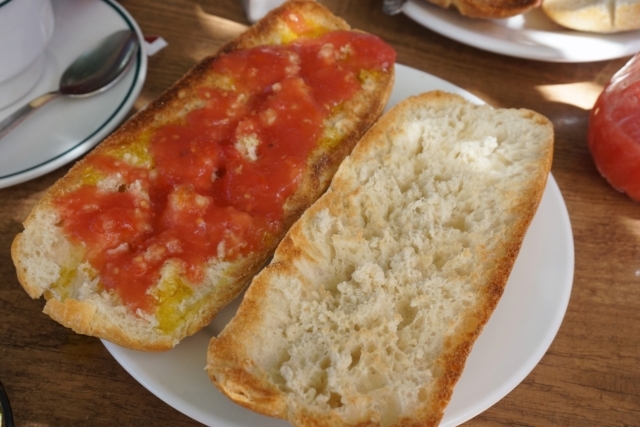 The Catalan dish, sometimes also called pa amb oli (bread with olive oil), tostada con tomate (toasted bread with tomato), or pan tumaca (tomato bread), is similar to the Italian bruschetta, due to the ingredients used. 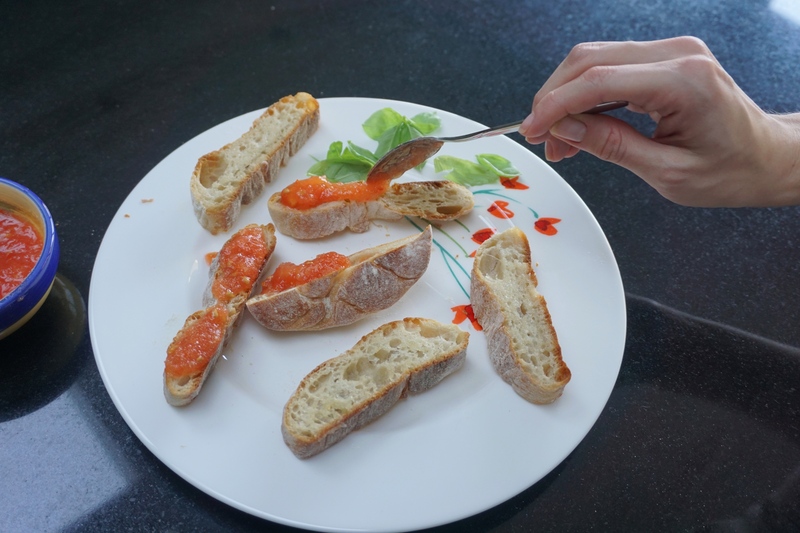 The difference lies in the fact that for bruschetta, tomatoes are diced, whereas for pa amb tomàquet the tomatoes’ pulp is brushed onto the bread. 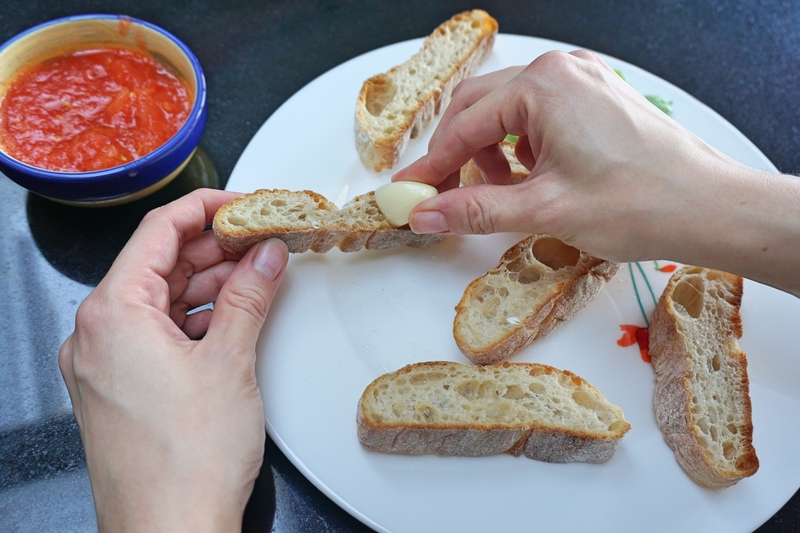 The more traditional custom (the one going further back) dictates that the tomato should be rubbed straight onto the bread, making the tomato a kind of condiment, with the focus on the bread. 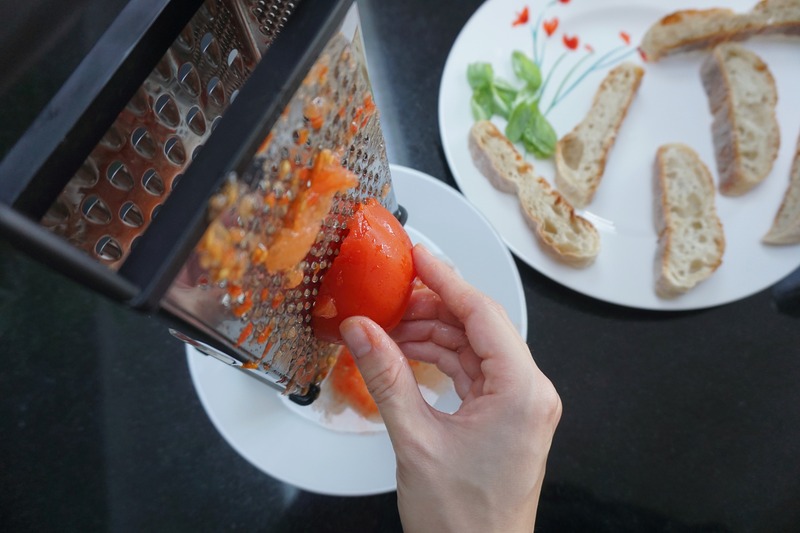 But arguably the more popular one consists of grating the tomato first, and then brushing the pulp onto the slice of bread, putting more of an emphasis on the tomato as a proper spread. There’s no need to concern ourselves with which method is considered better or more traditional. Rather, it’s nice to know of both of them, because depending on our mood and preferences, we may feel like eating one or the other. When we had pan con tomate in Spain, we were introduced only to the spread variety. 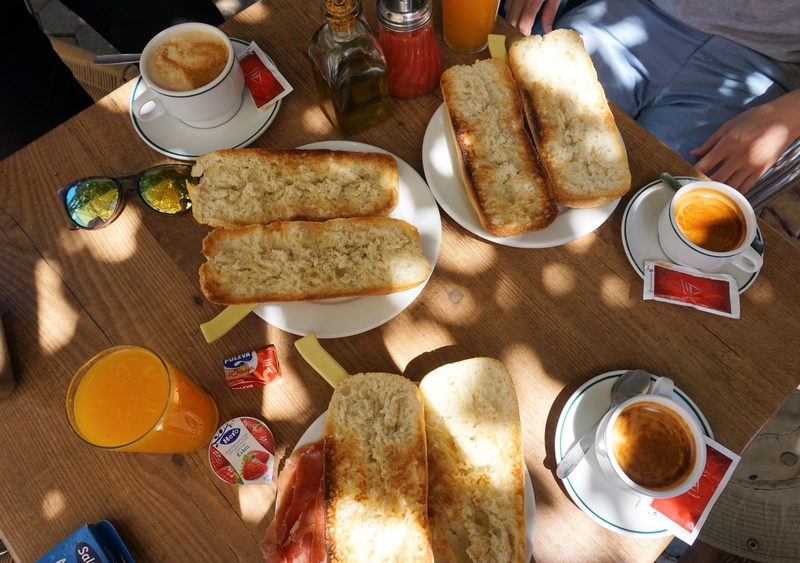 It was actually in Sevilla, not Catalunya, that I first had the great fortune of enjoying a crunchy bread, soaked in juicy tomato pulp and rich olive oil, on a sunny summer morning outside a local eatery called Café Piola. The tomato pulp came inside a kind of glass bottle with a pour spout, for easy application onto your slice of bread. Popular additions are iberico ham, cheese and anchovies, the former of which I enjoyed on that very first try. The second time round my attitude had changed from one of curiosity, to one of impatience and excitement. 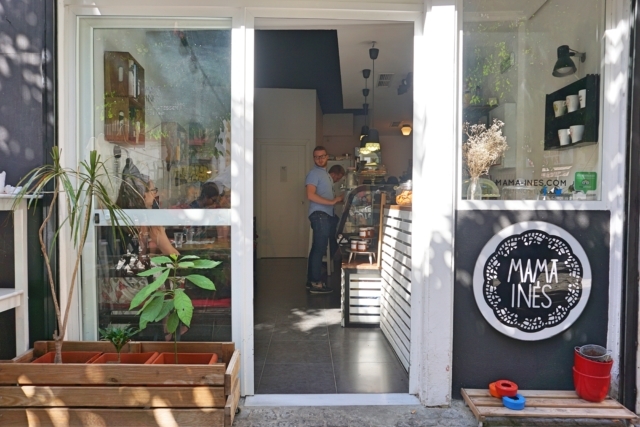 I was eager and keen to get my hands on the breakfast food, this time at Mama Ines. Also crunchy, also juicy, delicious too. As I am working on this blog post, I question myself and the reasons as to why I have not yet prepared the delicious pan tumaca. It’s been impossible to stop thinking about it, which is why I have now finally prepped the simple breakfast meal, leading me to include a simple recipe for you as well. Being able to prepare the tomato spread a little in advance makes pa amb tomàquet a perfect party food, and allows for further creations and innovations down the line as well. *If you can find so-called hanging tomatoes (tomatos de penjar), then go for those. Since they have lost their acidity and the water from the pulp, they have an incredibly rich and intense flavour. Cut tomato(es) in half horizontally, then rub the cut faces over the large holes of a box grater, catching the pulp in a bowl. The skin should remain intact in your hand and then be discarded. Season the tomato pulp with salt. Preheat oven to high. Place cut slices of bread in the oven to broil until brisk and starting to char around the edges, for about 2-3 minutes. Rub the bread slices with the split garlic clove after removing from oven. 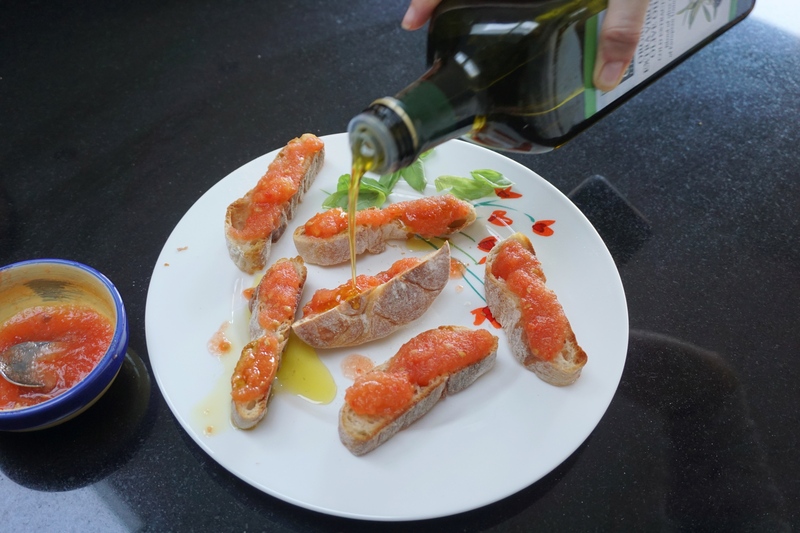 Spread the tomato pulp over the bread, drizzle with extra-virgin olive oil, and season with salt to taste. Add basil or other herbs for garnish and serve immediately. Tip: Step 1 can be prepared on the day or the evening before serving, and should be stored in the fridge.